This photo was taken on Saturday, Sept. 13, 1913, some eight weeks into a general Copper Country Miners Strike. 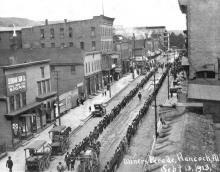 The striking miners marched most mornings in various Copper Country communities, seeking support. One of the more noted events during the strike was the disaster at the Italian Hall in Calumet a few months after this photo, in December, with a large loss of life, including many children. (Photo courtesy of The Mark Dennis Collection).